The Irish kicked off their season with a decisive 19-7 victory over the Michigan Wolverines in an exhibition match Saturday. Freshman midfielder Courtney Fortunato scored the first goal of the game and of her Notre Dame career less than five minutes into the match. Fortunato, sophomore midfielder Stephanie Toy and junior midfielder Caitlin Gargan led the team in scoring with three goals apiece. Junior midfielder Caitlin Gargan pushes forward against Michigan on Saturday. Gargan scored a hat-trick in the 19-4 exhibition win. Fortunato said she was excited to play other teams and shoot against other goalies after three intense weeks of practice. The Irish offense had consistent possession throughout the game, jumping out to an early three-goal lead. The Wolverines responded to the sustained pressure in their defensive zone with quick counterattacks. Their first goal came from freshman attacker Tess Korten 10 minutes into the first half. Freshmen constitute an overwhelming majority of Michigan’s roster: 26 of the 27 players are freshmen. All seven of the Wolverines’ goals came from these 26. 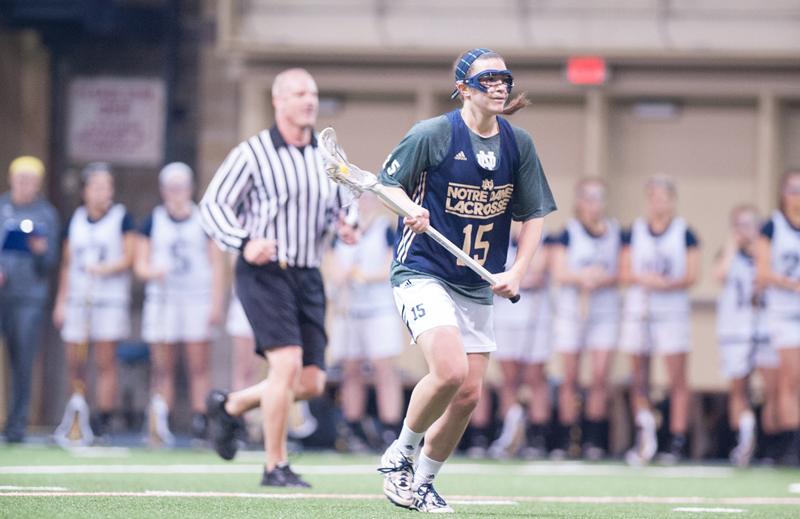 This is the Wolverines’ first season as a Division I team, and Irish coach Christine Halfpenny said she predicts Michigan will become an important rivalry as the team grows and establishes itself. Notre Dame, however, received goals from players with a wide range of experience. Sophomore Brie Custis scored an important goal early in the second half when a passing play culminated in an assist from Gargan to Custis, who rifled it passed Michigan’s goalie. This goal set the pace for the half, as it was followed by two more Irish goals less than a minute apart. The Irish score sheet also featured tallies from junior attacker Shauna Pugliese, sophomore attackers Michele Phillips, Kiera McMullan, and Rachel Sexton, sophomore defenseman and midfielder Hannah Hartman and freshman attackers Grace Muller and Heidi Annaheim. Although the Irish dominated possession, the Wolverines’ offense never let up in intensity or effort. The second half featured five Michigan goals as the Wolverines capitalized on penalty opportunities and long runs downfield. The Wolverines kept up the pressure through the last minute of the game as freshman attacker Kelly Schlansker notched a goal for Michigan in the last ten seconds of the game. Irish freshman goalkeeper Liz O’Sullivan took over for junior Allie Murray at halftime. Halfpenny said that the goalies’ performance reflected their off-season work ethic. The Irish face the Cincinnati Bearcats in their season opener at 5 p.m. Wednesday at Loftus Sports Center. Christina is a member of the University of Notre Dame's Class of 2017. She plans to graduate with a degree in finance. She writes for the Sports section of the Observer and enjoys playing soccer.